A white Audi car with no license plates was caught speeding along Commonwealth Avenue in Q.C. this morning. The car was carrying actor Richard Gutierrez and his driver. When MMDA officials flagged down the car, the actor allegedly said unkind words to the officials. A car carrying actor Richard Gutierrez was stopped by traffic enforcers this Tuesday morning, May 17, on Commonwealth Avenue, Quezon City, following a speeding violation. The 60kph speed limit was enforced in January of this year to minimize the number of road fatalities on the highway. Just last week, veteral journalist and University of the Philippines professor Chit Estella-Simbulan was killed on Commonwealth Avenue. Richard’s car—a white Audi driven by the actor’s driver—broke that limit when, according to the MMDA, cameras and speed radar guns registered the car’s speed at 79kph. The car was hailed to a stop near the Iglesia Ni Cristo church at 8:10 a.m.
"Medyo nagkaroon ng interception. Mayroon po kaming video. "Nag-speed limit po siya 79 kph. Ang limit po ay 60. Na-ticket-an lang po siya. "Hindi po siya ang nagda-drive ng Audi white. Wala pang plaka, brand new po." "CAPTAIN BARBELL WAS HOT-HEADED TODAY." In a report from inquirer.net, Richard supposedly ranted in reaction to his driver’s violation. This also supposedly prompted an MMDA area supervisor to say "Captain Barbell was hot-headed today" in his report concerning the incident. Richard is the star of the GMA-7 fantasy series Captain Barbell, where he plays the titular superhero. Richard and his driver reportedly came from the Quezon City Circle and were said to be on their way to Fairview for the taping of the actor’s TV series when they were apprehended. At press time, PEP.ph (Philippine Entertainment Portal) was in touch with Jun Lalin, the publicist of the Gutierrezes. A GMA-7 public relations officer has called PEP to complain about the report, saying that the MMDA has already spoken to 24Oras and that the MMDA has denied the allegations against the actor. 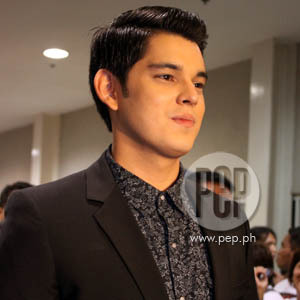 GMA-7 has Richard Gutierrez under contract. PEP will post further developments on this story and publish the statement of the actor.